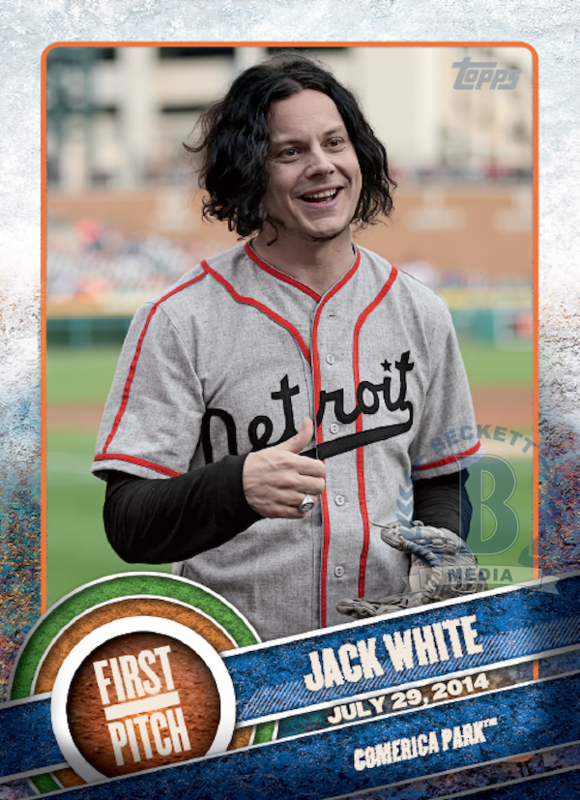 Jack White, Pearl Jam’s Eddie Vedder and Rage Against The Machine’s Tom Morello are among the musicians, actors and celebrities getting their very own baseball cards as part of a new set of cards coming from Topps next month. The cards are part of Topps’ 2015 Series 1 and also includes other famous faces such as Jeff Bridges and rappers 50 Cent and Macklemore. The series, called “First Pitch,” features shots of the participants throwing out first pitches at various Major League games. Jack White threw out the first ball at Detroit’s Comerica Park last July, while Vedder did the honors in the same month for his beloved Chicago Cubs at Wrigley Field. Some of the non-entertainment folks included are 105-year-old baseball fan Agnes McKee and a man named Tom Willis, who threw the first pitch despite being born without arms. The new series is due out on February 6th. Collect ’em all!